Dogs will feel like they are in heaven with the Skyline Dog Carrier by Pinkaholic. 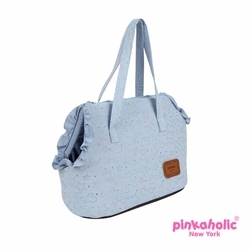 This stylish carrier has a star and hearts patterned and solid schemed. Inner leash for safety insures dog wont try to jump to the stars. Made of 100% cotton. Matching apparel sold separately.